New citizens stand during a U.S. 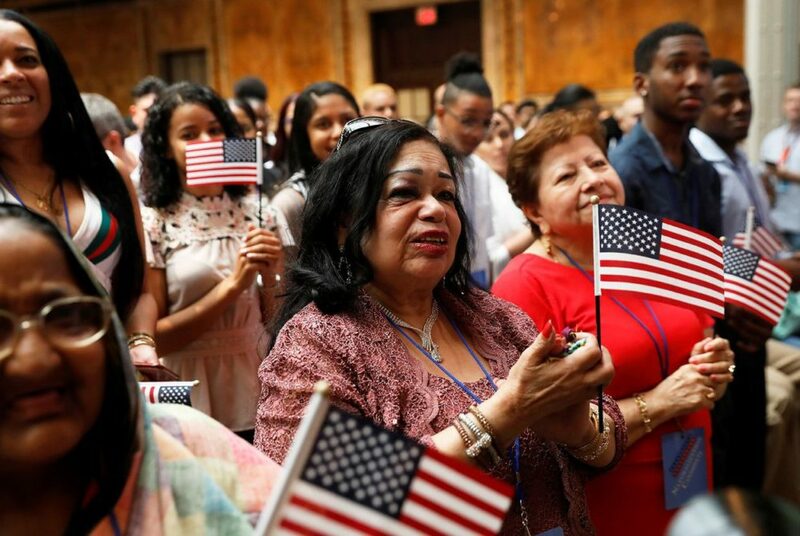 Citizenship and Immigration Services (USCIS) naturalization ceremony at the New York Public Library in Manhattan, New York, U.S., July 3, 2018. 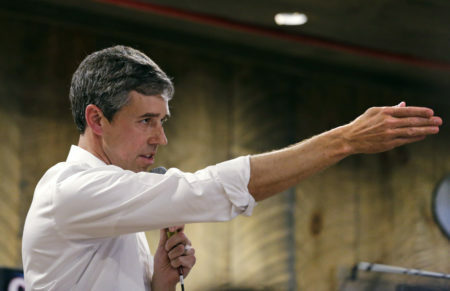 That sentiment appears to have carried over from the last presidential election cycle, when thousands of legal permanent residents in Texas applied for citizenship in hopes of securing their place in the United States. 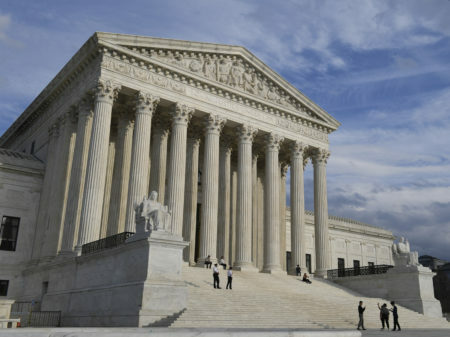 But against the backdrop of an administration working to upend longstanding immigration policies, the growing backlog in applications has emerged as a pressure point in the immigration system, according to lawyers working with naturalization applicants across the state. Those lawyers worry that the backlog affecting thousands of legal permanent residents — some of whom have lived in the country for decades — is reflective of a shift in a system that has long been key to the nation’s immigration policies. 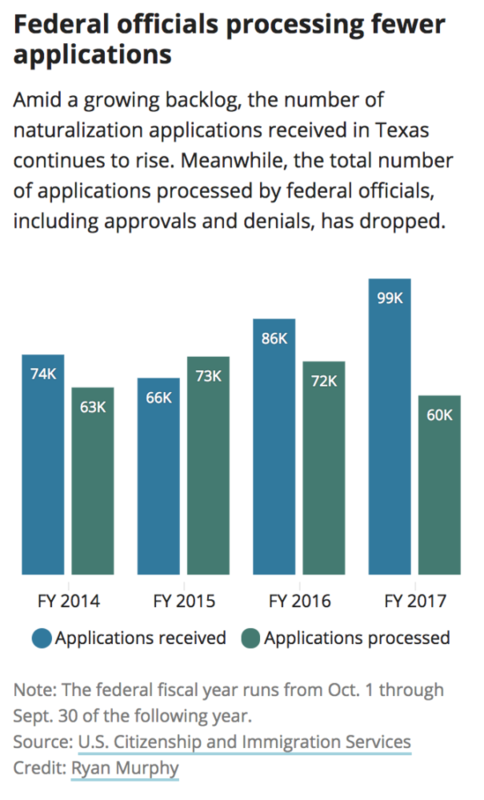 The most recent spike in the backlog of applications from green card holders looking to become U.S. citizens began toward the end of the Obama administration, following a surge in applications ahead of the 2016 election. But the waiting list has grown significantly under the Trump administration. U.S. Citizenship and Immigration Services’ estimated time range for processing naturalization applications vary widely. In Houston, federal officials set a processing time range between 17.5 and 19 months. In El Paso, the agency estimates the process can take anywhere from 7.5 months to 24 months. 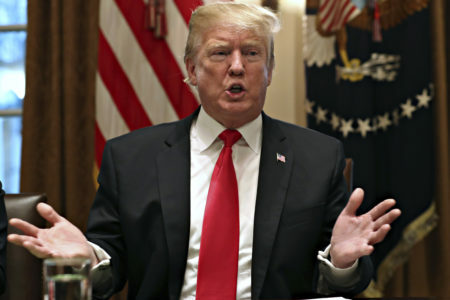 Federal immigration officials push back on claims of a growing backlog by pointing to their efforts to keep pace and even exceed the number of individuals naturalized each year — approximately 700,000 to 750,000 individuals — across the country. They note that USCIS revised its mission statement earlier this year to remove language that described the United States as a “nation of immigrants” and emphasize American security. And immigrants living in Texas — even those who have resided here with legal immigration status for decades — have sensed a shift in longstanding rules and protections that came with a green card, said Silvia Mintz, a Houston attorney who has practiced immigration law for more than 10 years. 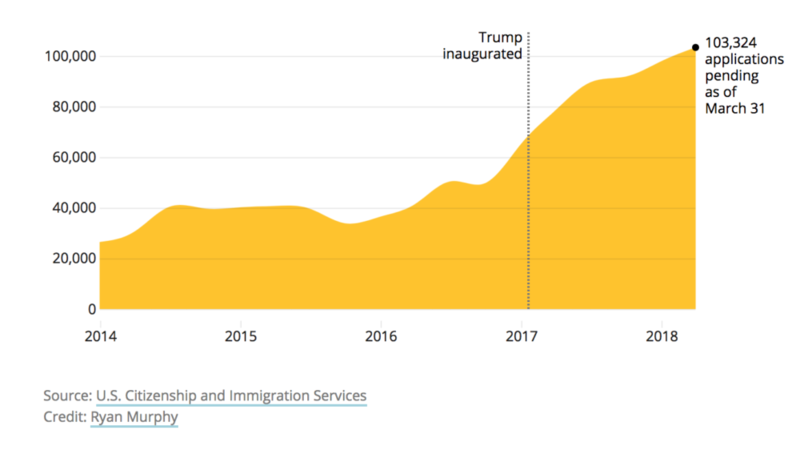 But the last few years have been transformative for the federal immigration agency, according to Julia Gelatt, a senior policy analyst at the Migration Policy Institute, a Washington, D.C.-based think tank. From the agency’s mission statement modifications to policy changes coming down the pipeline, there are several changes afoot at USCIS that could have implications for naturalization and even keep green card holders from applying.